Social-issues.org is a collaborative platform used by an online Community (mostly focused on sociology) to conduct research (using an eLaboratory), to synchronize efforts, to discuss issues, to learn, and to grow. What are the problems we would aim to solve? On launching our project, our first efforts focused on answering four essential questions. How do we create a synergy among researchers studying similar topics in different geographic locations, and thereby enable them to collaborate more effectively. How do we foster public debate and engage people in providing input for use in research and analysis? How can researchers collect and exchange reliable information for comparison given different cultural and social contexts? Is there a way to process and disseminate research results so that they are understandable, relevant, and accessible to the wider public? What is the idea/opportunity to solve the problems in question? In order to address the above questions and to give people a means of communicating with one another, we have launched an open, on-line community called social-issues.org. This community aims to develop a collaborative research entity which will synchronize scientific efforts and foster exchange of ideas related to key social issues. This community utilizes technologies such as e-laboratories, flexible linguistic options, and collaboration facilities. We hope to inspire educated debate, knowledge transfer, and the promotion of learning in a wide range of fields such as development studies, welfare economics, political philosophy, psychology, and sociology. "Social modeling applies computational methods and techniques to the analysis of social processes and human behavior. It's expected to provide conceptual and technological tools for supporting analysis and decision-making related to national and public security, political stability, law and order, and sociocultural changes. Modeling social and cultural processes draws on conceptual models and cultural insights developed within different social sciences. It aims to develop applications for processing heterogeneous data sources" (Lucy Resnyansky, "Social Modeling as an Interdisciplinary Research Practice" in IEEE Intelligent Systems, July/August 2008, pp.20-26). What makes our Online Community different from any other existing tools and communities such as online argumentation (e.g., Debatepedia, Magtalo, Convinceme.net), professional social networks sites (e.g., LinkedIn), and "heavy-client" modeling tools (e.g., Protégé)? Our Community is multilingual. Our eLaboratories enable us to be involved in a collaborative creation process of any model in different languages in parallel. The multilingual model elaboration is supported by a set of integrated tools as a workflow engine, translation facilities, reviewing panel for bias detection, "intelligent" forum, etc. Our Community is based on a set of interconnected innovative tools. The technologies we use have already proved to be a big success in electronic assessments. OECD countries are employing them for the PISA (Programme for International Student Assessment) and PIAAC (Programme for the International Assessment of Adult Competencies) projects in 2009, as well as the NAEP (National Assessment for Education Progress) program in the USA. Within this Social-issues.org, we are adapting these technologies to benefit a larger number of people, starting within the field of social sciences. Our Community offers a set of tools capable of supporting all the operations involved in modelling, survey question design, assessment and other tasks where flexibility and collaboration are key factors. Hence, we believe that our Online Community has clear potential to contribute to better understand and measure the notions of good life and to extend the range of comparability of socioeconomic data in different countries. Until recently, poor user interfaces, lack of transmission speed, rigidity in the communication protocols, and limited expressiveness in data exchange formats have made effective online collaboration difficult. Recently, High-speed Internet, Rich-Internet Application paradigm, web services protocols, peer-to-peer organization, and semantic web have revolutionized our relation to the Web. Our Community benefits directly from these innovations while also using cutting-edge technologies enhancing not only the way scientists collaborate online but also allowing ordinary people to contribute to public debate on social issues. Technologies used in our platform (probably, version 1 and 2) are about to become open-source in winter 2008/2009. Below, here is a detailed description of our online community, reprinted from a part of a paper titled "Development of a Platform Dedicated to Collaboration in the Social Sciences" by Raynald Jadoul and Sachie Mizohata, presented at the IADIS international conference CELDA (Cognition and Exploratory Learning in Digital Age) 2007, Algarve, Portugal, December 7-9, 2007. Definitions of the word “laboratory” have evolved over time, encompassing more meanings. In its broad understanding, according the Merriam-Webster dictionary, a “laboratory” is a “place providing opportunity for experimentation, observation, or practice in a field of study.” The Cambridge Advanced Learner's Dictionary adds the “teaching” dimension to the definition. However, these definitions agree that a laboratory needs to be properly designed and appropriately equipped. Nevertheless, our consolidated definition is somehow a bit simplistic for those who know the reality of a laboratory, but also quite vague for others who have never worked in a lab. We may add that a laboratory should also be a controlled environment – safe for lab workers and the work. The laboratory should provide scientific apparatus for data collection and analysis, as well as mechanisms for recording the process and flow of various activities. Lab researchers are accustomed to using personal notebooks to write down their private thoughts, and white boards to share ideas in a more public way. Besides the lab itself, there should also be coffee-break areas where new ideas can be exchanged spontaneously with others. The “laboratory” then, is a complex space with both private and public areas, and provisions for many kinds of tasks. A “virtual laboratory” or “eLaboratory” should have all the facilities described above, perhaps with some limitations and certainly with some enhancements. This was the starting point of our community. Social-issues.org is a collaborative platform used by an online Community (mostly focused on sociology) to conduct research (using an eLaboratory), to synchronize efforts, to discuss issues, to learn, and to grow. In this paper, we first present the foundation concepts of the social-issues.org community. 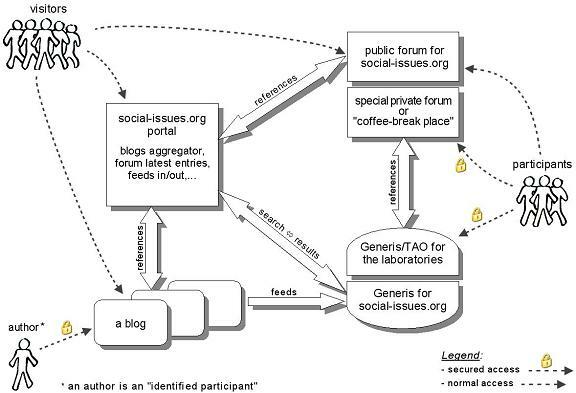 We then introduce the platform and explore some of its components: the laboratory, the publishing facilities, and a special module named “the coffee-break place.” Later, we illustrate how the system is used in the context of a social science demonstration. Finally, we conclude with the perspectives of the community. The Community is dedicated to the free expression of ideas dealing with social issues. An open and free speech community does not mean anarchy. It does require members to respect the differences and dignity of others. We can have stimulating discussions and criticisms without apprehension; no personal attacks will be tolerated. Rules apply on the content of work published on any part of the Community website, meaning moderators may require an author to cite the references used in a publication when those are not clearly present. Moderators can also block an article (blog, book, or forum entry) when its content infringes copyright. Moderators may also withdraw or limit access of users who do not conform to appropriate netiquette. Everyone is welcome to contribute as long as their work meets the necessary standards for professionalism and academic integrity. The Community will not exclude potential contributors and participants because of their affiliation; even if the first labs developed in the Community rely on the Capability Approach theory, this theory is just one among many, and future labs may choose other approaches in order to address diverse topics such as poverty, AIDS, domestic violence, human rights, and so on. Participation in the social-issues.org community can have different forms. One can be an author of articles in a blog while another might simply react to an article and leave comments. In the Forum, one can ask questions in the hope that others will answer them. Visitors to the website are readers who are allowed to consult the news, the announcements, the public forum entries, the shared publications and the online books. They may write comments on blog posts. Also, in conjunction with the moderators, they contribute to keep the published contents “clean,” i.e., free of abuse. Participants can be scientists developing theories related to social issues, "real world" practitioners and activists, representatives of non-profit organizations, Ph.D. students trying to contribute to the domain, politicians who might clearly explain how their government is addressing a particular social challenge, or any ordinary relevant people interested in the field of sociology. Anonymous participants register with minimum information, i.e., a pseudonym and a valid e-mail address; these participants may contribute to the public forum. When they have clearly identified themselves, their status can be upgraded to “identified participants,” giving them additional access rights. If identified participants are active social science professionals, they have the right to open and lead a blog on the social-issues.org community. They can also access the “coffee-break place,” i.e., a special private forum where it is possible to start a chat with a small group of invited members. Identified participants may have their own private laboratories on the platform to conduct research. They can also be invited into a laboratory that already exists (this would be up to the director of the lab). Moderators verify that the produced contents conform to the policies of the Community. As the moderators cannot read all the public contents hosted on the platform, some mechanisms will allow any user (including non-registered members) to submit a contestation query regarding any published information. In the figure below (Figure 1. A simple organizational view of the major components of the Community), the entry point of the system is a portal that aggregates the latest entries of the blogs hosted by the Community, the most recent discussion topics of the public Forum, the feeds coming from blogs and websites not hosted by the Community (but dealing with the relevant topics). This portal also provides news about the Community’s development, conference announcements, and so on. Please note that this chart shows only a part of the relations between the components of the system. When identified participants are logged on to the system via “secured access,” they enter into their own private workspace, which can be customized to their preferences. Those users may access the private forum and an internal messaging system where they receive messages and invitations (for collaboration, reviewing, etc) sent by members of the Community. In addition, their inboxes can contain reminders of the events of their private and public calendars to which they subscribe, as well as reminders sent by the workflow agents regarding tasks to be accomplished in a module of the platform (e.g., in a laboratory). An identified participant may be the main author of one blog and contribute to other blogs when invited by their main authors. Identified participants may also start or contribute to the writing of an online book. The public forum is quite common these days. However, even if completely free for reading access and searching, it usually requires a basic registration (as “anonymous participant”) in order to ask or to answer questions. The private forum (with its “coffee-break place” mechanism) and the laboratories described here are more interesting and richer in functional terms. They will be described in the next section. An important technical point is that the blog posts will be written in different languages: Arabic, Chinese, English, French, Finnish, Japanese, Spanish, Urdu, and the like. However, in all cases, for each posted article, the authors will have to provide a short summary and key words in English. This will enrich the results of the search queries made by visitors. However, moderators will be on guard to avoid anything (personal attacks, innuendoes, etc) that can damage the good reputation of the Community. Any identified participant can write personal (private) online books. A private book may be shared by its author with other members of the Community. When an identified participant wishes to start writing a public online book, she or he must first write a summary and must send it to the Community where it will be evaluated. If there is no objection, the public writing can begin. The author of a public book is responsible for the organization of its content and the management of the contribution efforts (or responsibility can be shared). However, a moderator is always attached to the production of a book. The moderator does not contribute to the writing, though she or he may act as an advisor and an editor. The translation of an existing book is also the responsibility of a main author under the supervision of a moderator. Private books may be upgraded to become public books if all the conditions (presence of an abstract, valid and “clean” content, etc) are respected. Regarding the elaboration of an online book, the “coffee-break place” is often a good place to start such an initiative, to collect feedback and to recruit volunteers (for writing, editing, collecting materials, and so on). This component of the platform is in fact more than a classic private forum. It is a place where messages may be posted, where questions may be asked and answers may be found. It is also a place where it is possible to meet the other members (identified participants) of the Community and to start conversations with them “face to face” or in groups. This chat functionality may be a written or voice conversation. Video may be available in the future. The written conversation as well as the figures sketched (using a shared whiteboard) may be saved for reuse.